I planted these bean seeds back in the spring when I planted the rest of my garden. 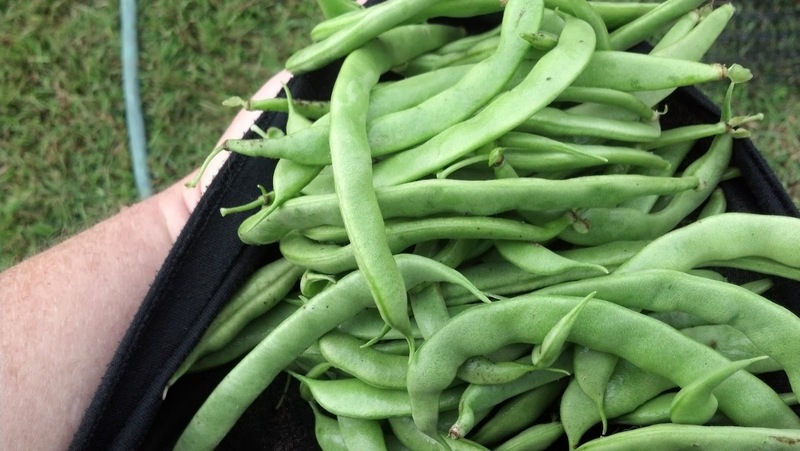 Spring is when green bean vines are supposed to grow, giving us beans all summer long. But this year we had a cold, wet spring and a cool, wet summer. My green beans germinated, grew, faltered, and died along with my tomatoes and squash and most of my cucumbers. But one little green bean seed didn't germinate with the rest of them. He waited out the cool wet summer and started growing at the end of the season. Maybe he was trying to live up to his moniker - a Wonder. I knew his timing was all wrong. I knew he didn't stand a chance. But he had strong legs, looked so good and was trying so hard, I figured I'd wait and see what he came up with. For a while, nothing. Then, blooms. I wondered if the right insects were around to pollinate properly. I toyed with pulling the whole thing up. But he had come this far and I wasn't in the mood to plant anything in his place. I figured he deserved a chance. And I was curious to see how soon he would fail. So I left him alone. He's been busy making green beans, this little renegade plant. Enough to cook and serve for my husband's birthday dinner, alongside homemade meatloaf and pineapple upside-down cake. And he hasn't stopped. Yesterday one of our friends was standing in our backyard, picking tender crisp bean pods and eating them raw, raving about how delicious they were. I just picked another mess today for tonight's dinner. 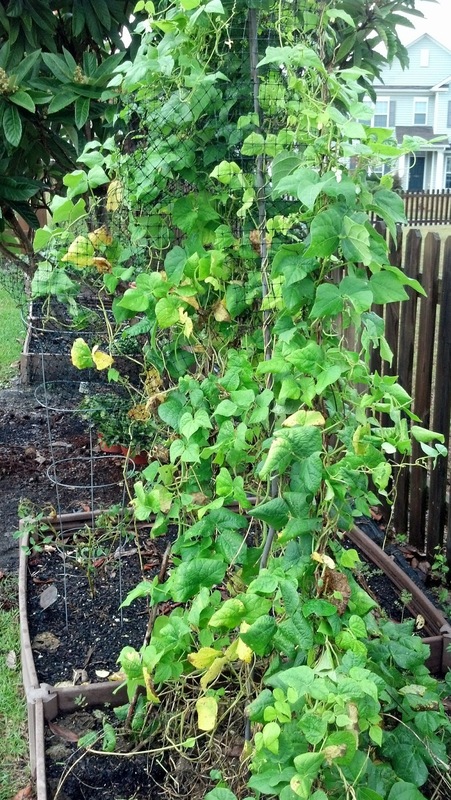 Apparently this bean plant doesn't care that it is October. He didn't get the message that he's supposed to be slowing down. He's still going strong, blooming like crazy. The more beans I pick, the more he produces. He looks happy being his beany best. And just looking at him makes me smile. I'm going to let him do his thing until he just can't do it anymore. The crazy bean plant reminds me of my husband. At 65, he's been through a lot of seasons. So many people his age have slowed down, retired, faltered, or worse. But somehow he is even more vibrant now than when we met 22 years ago. He has a few more aches and pains, but he still has a spring in his step, a smile on his face, a gleam in his eye. He is still going strong and blooming like crazy. Partially it's due to his genes. Both his parents lived until their 90s. Partially it's due to the culture of his family. His father was still docking ships into his late 80s wearing his signature blazer and leather loafers. His (slightly) older brother is still teaching acting and directing plays, and his (barely) older sister is still writing and running a casting agency. Partially it's due to his faith. He believes he's here for a purpose and thinks that purpose is ongoing. Plus, he doesn't find anything about retirement in the Bible. Sure, he'd like to have more time to play golf, but the idea of a resting on his laurels just doesn't hold much appeal. Partially it's due to having four children ranging in age from 38 to 11, and two rambunctious grandsons. It's hard to give up when you're still raising children. Partially it's due to our love for each other. Even in the worst of conditions, love has a way bringing things to life where no one thought they could grow. And all of these things combined give him a resolve that refuses to stop. Like my bean plant, he doesn't accept the message that when the October of life comes, you're supposed to slow down and stop producing. Which is a good thing, because at 65 he finds himself starting over again in his career. He didn't plan for this to happen. But it did. It would be easy for him to throw in the towel at this point, just retire, stay home, be my trophy husband. But he's still valuable, still valued. There is still work to be done, lessons to be taught and learned, wisdom to be shared. There is still fruit to be borne. Just like my crazy prolific bean plant, I find my husband amazing. He might not be from Kentucky, but he is definitely a Wonder. I enjoy watching him grow and growing with him. Just when I think I know everything about him, he surprises me with something else. Just like my bean plant, he has strong legs, looks good and tries hard...with extra emphasis on the strong good-looking legs. I think I'll hang around and see what he comes up with next. I'm sure it will be amazing.